Few skin conditions are as horrifying to people as lice or scabies infestations. Though billions of microscopic bacteria, viruses, and fungi swarm over us constantly, the thought of actual visible bugs crawling on our skin and hair makes us shudder. Scabies and lice are different, but each infests us in similar ways. There are three types of lice --- head lice, pubic (crab) lice, and body lice. They are all transmitted in the exact same way: close body contact with an infested person, or contact with shared items like clothing, bedding, combs and brushes, and yes, even toilet seats can pass these creatures onto you. They do not jump from person to person though. Lice bite the skin to feed on your blood, and this is what causes the characteristic itching. Head lice: Kids up to 12 or so are usually affected, but their parents or other family contacts are also at risk. Frequent scratching of the scalp usually leads to inspection by an adult and the classic findings of nits (lice eggs). These nits are white and tear-drop shaped, seemingly glued to hair shafts near the scalp. For examination, always use a bright light and magnifying glass. Once youve found nits, you neednt search for live lice --- rest assured they are present, and finding them will only give you the creeps. Pubic (crab) lice: They do have a crab-like appearance, and are slightly larger than head lice. Many people think they are specs of dirt --- until they move! 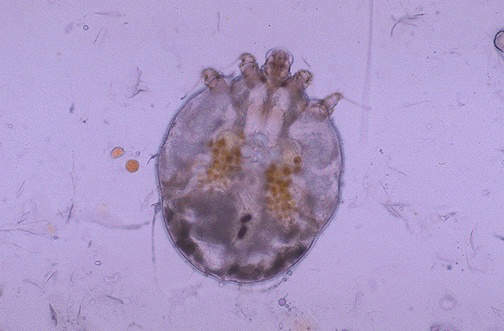 Crab lice are found in other hairy areas, too: underarms, eyebrows and lashes, and facial hair. 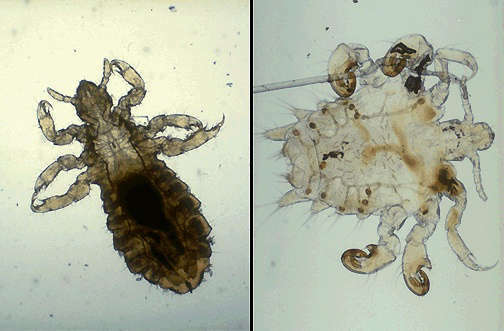 Body lice: These actually prefer to live in clothing, and travel to the skin surface only to feed before going back. You often cant find them until you look at clothing (especially seams) for the nits or lice. Those who dont change clothes often (homeless or lower social economic groups) are at higher risk. Though hygiene has little to do with pubic or head lice, body lice thrive in lower socioeconomic groups where clothes arent frequently changed or washed. These mites are much tinier than lice, and you cant even spot them. Furthermore, they spend almost all of their lives burrowed into your skin. Scabies are recognized by their tell-tale tracks --- small lines in the skin that look like little scratches, about 1/4 inch long. Youll usually find tracks in groups at the wrists, buttocks, underarms, groin, and especially the webs between the fingers. Scabies cause intense itching from the eggs and droppings they leave under your skin. Prevention is strictly a matter of avoidance. With the exception of body lice, bathing wont help much because soap wont kill lice or scabies, and they cling forcefully to the skin. Body lice are prevented by washing your clothes and bedding in hot water and drying; they dont stick well to your body or hair. Sharing clothing, beds and sleeping bags, and unfortunately toilet seats, all increase your risk of hosting these creatures. If you or your children have contact with someone who has lice or scabies, do a careful magnified inspection of the usual areas as described above. If you find any lice or scabies, call your local health department and schools right away! Dont be ashamed. Remember somebody else passed them to you, so you neednt feel dirty or that youre a neglectful parent. Others will be grateful if you sound the alarm early. There are two types of products available without prescription that are effective for lice: permethrin and pyrethrins. Permethrin in a stronger concentration is effective against scabies, however it is not currently available for OTC use, so you would need to see a doctor to get a prescription. There are several very effective scabies treatments that are available over the counter. Specific recommendations are below in our Recommended Products section. For treatment of lice, take care to read label warnings and instructions carefully. The regimen of applying the medicine, washing it off, and removing nits must be followed exactly. Then comes the chore of washing clothing and bedding (if clean, you can just put them in a dryer on high for 20 min.). Cleaning nits from thick or long hair with the special comb (included with delousing shampoo) can be very time-consuming and difficult. Cutting hair short may be necessary to prevent recurrences due to poor penetration of the shampoo in large amounts of thick hair. For lice, only those with nits need to be treated. But since it can take days for scabies to cause any symptoms, the entire household and close family contacts should be treated even if they show no signs of infection. Itching can be intense and last for days even after you have eliminated the pests. Antihistamines help, especially at night when drowsiness side effects can improve your sleep. Surface acting anti-itch and anesthetic products offer good temporary relief without drowsiness, and work almost instantly. Fairy Tales Lice Removal Kit The active ingredient in this lice killing shampoo is considered the treatment of choice for treating head lice in adults and children 1+ years of age, and its also effective for pubic (crab) lice. Results should be noticeable and immediate after a single application. Naturasil is an all-natural scabies treatment that is extremely effective. Unlike prescription medications, it does not contain any pesticides or other potentially harmful ingredients. They also offer a skin cream, which relieves the intense itching scabies causes. Benadryl (diphenhydramine 25 mg). This brand of anti-histamine is particularly effective for uncontrollable itching in the evening and during sleep, where its drowsiness side effect combines with its primary anti-itching properties to give much more restful nights. Remember, the itching from lice bites can take several days to resolve even after the lice are eliminated. Dermoplast spray (benzocaine 20%, menthol .5%). For immediate relief from surface itching and pain, there is nothing more effective than the active ingredients in this product. The spray bottle is a convenient method of application, too. Infection of the affected skin areas is common, and should not be self-treated. Crusting, oozing, intense or spreading redness, and swelling are all signs of infection and should be evaluated by a physician right away. As mentioned above under Treatment, you must have a doctors prescription for the higher potency permethrin medication for scabies. For lice infestations, there are actually few reasons to see your doctor since prescription products havent been shown to be more effective than the OTC products above. In fact, some studies show permethrin to be better than the prescription choices. But if the problem doesnt go away after diligent home treatment, or if you are unsure about the diagnosis, see your doctor.